Here is some information on Conditional color scales in Office 2010. When creating a chart, data can sometimes be missing. You have a choice of leaving the cells empty or making them zero. By default, an empty cell will leave gaps in your graph. Zero entries will send a line graph down to the base line. One way to force Excel to interpolate the data is to enter the function =NA() in the empty cells. Another way is to go to Tools>Options and choose the Chart tab. Pick how you want data plotted - with gaps, as zero, or interpolated. "If the datasheet data for the category axis contains date number formatting, Microsoft Graph automatically uses a special type of axis in your chart called a time-scale axis. A time-scale axis shows a blank category for dates for which you have no data. If you do not want to see these gaps â€” for example, if you have data for 1-Jan, 15-Jan, 3-Feb, 12-Feb, and 2-Mar, and you want to plot the days next to each other - you can change the time-scale axis to a standard category axis. On the Chart menu, click Chart Options, click the Axes tab, and then click Category under Category (X) axis." Note, For 2007+, on the Design tab, click Select Data in the Data area, and then click Hidden and Empty Cells on the Select Data dialog box. A graph or chart can give the reader a visual representation of a great deal of data. Concepts or results can be more easily grasped by a well formatted graphic. Charts, usually, take up more space in a document than is absolutely required. These are small graphs about the same height and width as common words. They are not out of place in the text of a document. Sparklines give the reader a snapshot of the data that quickly supports the material being discussed. The Sparkmaker can create Sparklines for Word, Excel, or PowerPoint. They can also be produced in HTML. Alan Myrvold has written a background article on how Office handles passwords and what password strength means. "Word, Excel, and PowerPoint have been able to password protect documents for several versions by setting the 'password to open'. What we felt could be improved was the ability to enforce password strength rules, similar to what may be required when logging into your computer at work." Pre-2007 Excel was limited to only 3 conditions. The new Office is more generous and versatile. Use this to create a data bar, 2-color or 3-color color scale, or icon set rule. Use this to create the Excel 2003-style rules and more (format cells greater than, less than, greater than or equal to, less than or equal to, equal to, not equal to, between, not between). This is also the entry point to create rules of type: specific text, date occurring, blanks, non-blanks, errors, non-errors. Use this to create top n, top n%, bottom n, bottom n% rule types. Use this to create above average, below average, 1 or 2 or 3 standard deviation above, or 1 or 2 or 3 standard deviation below rule types. Use this to create rules that format unique or duplicate values. Use this to create Excel 2003-style rules where you can enter a formula to determine whether a format should be applied. The judicious use of formatting can make data easier to understand as well as pleasant to see. Scott Lowe put together a series of articles on how to format data in Excel. If the data you brought into Excel comes through as text rather than numbers, Paste Special can fix it. Go to an empty cell. Go to Edit>Paste Special and choose Add. What's So Special About "Paste Special"? To make use of this file(s), locate the help topic of interest and make a note of its context ID. Then, write a VBA subroutine that displays the topic. You can attach the subroutine to a button, or provide some other way for the user to execute the sub. you'll find that the context ID for that particular topic is 5199659. The following VBA procedure displays that help topic." Use Ctrl+1 to bring up Excels Formatting dialog box. Shift+B will take you to the Borders tab. Apply or remove the top border. Apply or remove the bottom border. Apply or remove the left border. Apply or remove the right border. Apply or remove the downward diagonal border. Apply or remove the upward diagonal border. Apply or remove the horizontal interior border. Apply or remove the vertical interior border. give interior (vertical and horizontal). brings up the color palette. Ctrl+Shift+7 will outline a cell without having to display the Format dialog. 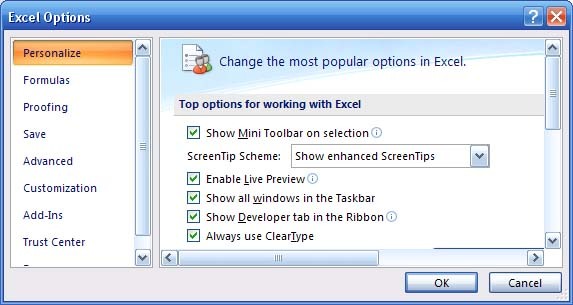 As it comes out of the box, at this point, Excel 2007 is set to display spreadsheets on the task bar. No big deal 2003 did too. If, however, you only have one workbook open and want the application to shut down when you close the book you must make a little change. Just as before, you must deselect Windows in the Taskbar from the View Options. John Walkenbach has put together an FAQ on Workbook/Worksheet/VBA protection. The Microsoft Knowledge Base article KB 293445 Has a list of references to protection information. Worksheet protection: You can protect elements on a worksheet (for example, cells with formulas) from all user access, or you can grant individual users access to the ranges that you specify. Workbook-level protection: You can apply protection to workbook elements, and you can protect a workbook file from being viewed and edited. If a workbook is shared, you can protect it from being returned to exclusive use and prevent the change history from being deleted. How can I grant only a few users access to a range in my worksheet? Why are users not allowed to edit the ranges that I established permissions for? What new features are available in workbook protection? Why don't the permissions that I set on ranges in my worksheets carry over to Windows 98 computers? You might want to check out Mike Alexander's blog post about how easy it is to remove worksheet protection in Excel 2007. Changing the names of tabs is easy, just double click the tab or right click and choose rename. Allen Wyatt has a small piece of code that will automatically update the tab name based on the value of a cell in the spreadsheet. Ed Ferrero has a number of sample Excel charts and tools. 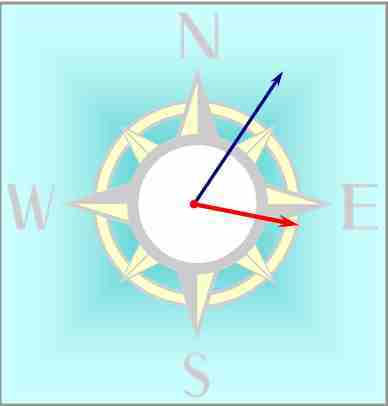 How to build a wind rose. Converts compass directions to degrees and radians, and plots a nice-looking chart. If you find a need to provide some sort of certification that your document has not been tampered with and is the rel thing, you might consider a digital signature. This Microsoft Support article discusses the process. What occurs when I use a digital signature? What Word files can I sign? How can I obtain a digital signature? You can protect a spreadsheet so that data is shielded from inadvertent entries. There is another way to set up a scroll area that does not involve protection. Open the Control Toolbox (right-click any existing tool bar) and click on the Properties icon. In the Scroll Area text box, type the scroll area range, or type the defined Name for the range. To cancel the Scroll Area restricted range, clear the Scroll Area text box. If you are using Office 2007, the Property icon is on the Developers tab. Multiple areas can be selected using Protection, but only one area is allowed using the Scroll Property. While this problem is alleviated in Excel 2007 with its 1,048,576 rows by 16,348 columns, The old XL versions are still here. Text files with a large number of records are better handled in a program like Access. Having said that, there can be times that these lists must be imported into Excel. If the file has over 65,536 records, the data will not fit on a single worksheet. Notice the code about 17 lines from the bottom of the macro. 'For xl97 and later change 16384 to 65536. Also, after import, the data must be parsed. Use Data>Text to columns. XML makes data transferable between applications. Here is a tutorial with downloadable files. Some simple guidance of how to transfer data from Excel or Access into HTML web pages using XML data files. VBA programs can be used to export data tables from Excel or Access into simple XML files. There are several examples of using different methods to display the XML and XSL files on web pages in order to quickly share your data with others. To reset the original settings in Office 2003, follow these steps. Make sure that you back up your files before you follow these steps. 1. Start any Office 2003 program. On Help menu, click Detect and Repair. Click to select the Discard my customized settings and restore default settings check box, and then click Start. Quit the application, and then click Ignore. Reset of setting to default succeed. squinted your eyes trying to see the numbers in a PowerPoint presentation? scratched your head at a charity leaflet with an indecipherable pie chart titled 'Where your donation goes' ... and set it aside? missed discussion at a meeting because you were busy trying to figure out the figures? put aside a graph or table, thinking "I'm not good with numbers."? what to include: when unsure what numbers are important, people frequently display them all, overpowering the reader with irrelevance. 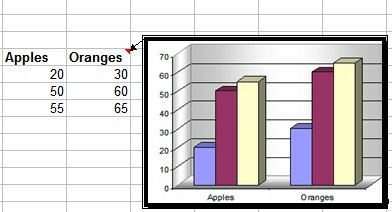 which format to use: the choice between text and table, table and chart, bar and pie. how to use the technology effectively: computer software generates graphs easily, but the results hide your point behind incomprehensible chartjunk. how to explain the information: selecting the right words for titles, columns and captions. 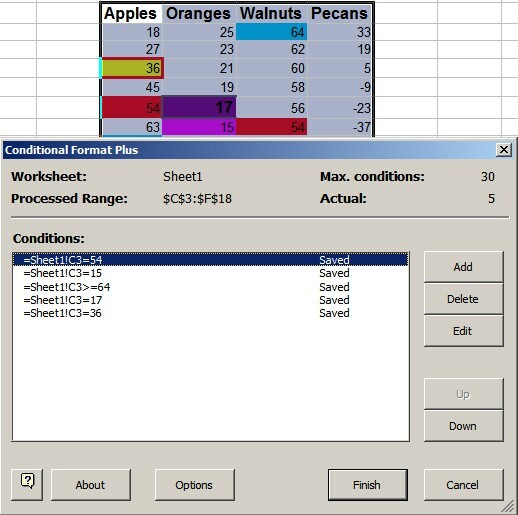 Pre-2007 Excel gives the user the ability to specify up to three conditions under Format>Conditional Formatting. If that is not enough, Frank Kabel and Bob Phillips of xlDynamic.com offer a free download that extends the conditions to 30! The Excel 2000 Report Manager add-in is not included with Excel 2002+, as was the case with previous versions of Excel. To use it, you must first download the Excel 2002 Report Manager add-in from Downloads on Microsoft Office Online. Follow the instructions on the Downloads page to install the Report Manager. "Using the Report Manager add-in program, you can combine worksheets , views (a set of display and print settings that you can name and apply to a workbook. You can create more than one view of the same workbook without saving separate copies of the workbook. ), and scenarios (a named set of input values that you can substitute in a worksheet model.) into printable reports. For example, if you have a Best Case and a Worst case scenario, a Summary view, and a Details view, you can create a report that presents the Best Case scenario in the Details view and another report that presents the Best Case Scenario in the Summary view. Reports that you create are automatically saved with your workbook so that you can print them at any time." Note If the Report Manager is not available on the View menu after downloading the add-in, click Add-ins on the Tools menu, and then select Report Manager. On the View menu, click Report Manager. In the Report Name box, type a name for the report. In the Sheet box, click the sheet you want to use for the first section of the report. To use a view for the first section of the report, select the View check box, and then click the view in the View box. To use a scenario for the first section of the report, select the Scenario check box, and then click the scenario in the Scenario box. Click Add to enter the view or scenario as a section in the Sections in this Report box. Repeat step 5 and 6 until you've created all of the sections you want in the report. To change the order of the sections, in the Sections in this report box, click the section you want to move, and then click either Move Up or Move Down. To number the pages of the report consecutively, select the Use Continuous Page Numbers check box. Note Microsoft Excel prints sections of a report in the order in which they're listed in the Sections in this report box. In the Reports box, click the report you want to edit, and then click Edit. To add a new section, click the sheet, view, and scenario you want under Section to Add, and then click Add. To delete a section, click the section in the Sections in this report box, and then click Delete. In the Reports box, click the report you want to print. In the Copies box, type the number of copies you want to print. Excel no longer has a theoretical limit on the number of worksheets in a workbook. One common use of this ability is to add a worksheet for each week in the year. Here is a discussion about how to use data that may be on a different worksheet, or another workbook. Getting data from other sheets can be very easy: or it can be very hard, it all depends on what you need to do. This article looks at some of the ways you can get data from other sheets. The keyboard combination of Alt+Shift+D inserts the current date in MS Word and PowerPoint. Ctrl+; (semicolon) does it in Excel and Access. If you do not like the date's format, select a different one with Insert>Date and Time and, if you would like to make that permanent, click on the Default button in the lower left corner of the dialog box (in PowerPoint it's in the lower right corner). 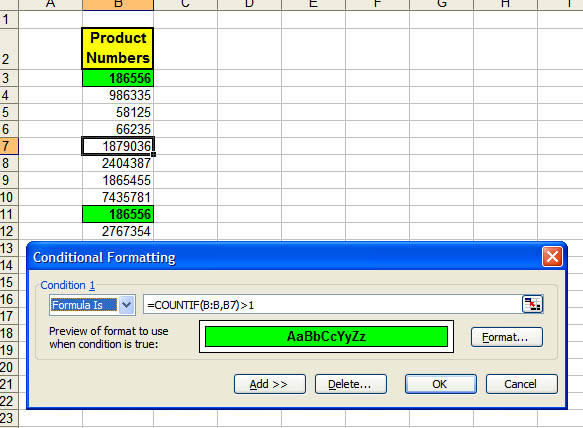 In Excel, Ctrl+Shift +# formats the entry as day-month-year. 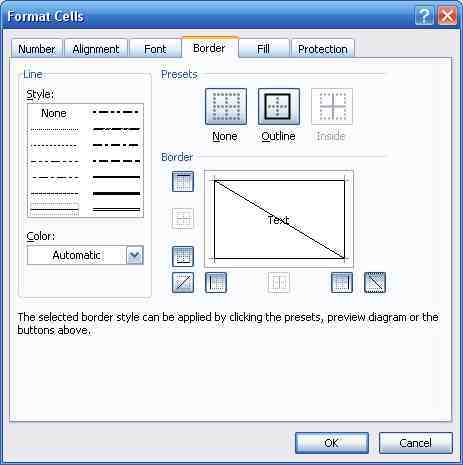 Ctrl+1 will display the "Format cells" dialog box. BTW, the "hash, pound or number" sign # is also called an "octothorpe". The person who named it combined Octo for the eight points and Thorpe for James Thorpe. "Bell Labs engineer, Don Macpherson, went to instruct their first client, the Mayo Clinic, in the use of the new (touch tone phone system). He felt the need for a fresh and unambiguous name for the # symbol. His reasoning that led to the new word was roughly that it had eight points, so ought to start with octo-. He was apparently at that time active in a group that was trying to get the Olympic medals of the athlete Jim Thorpe returned from Sweden, so he decided to add thorpe to the end." While we're at it, the "backwards P, Enter mark" Â¶ is actually named a "pilcrow". The pilcrow was used in medieval times to mark a new train of thought, before the convention of using paragraphs was commonplace. Ron de Bruin, Microsoft MVP - Excel, has put together a collection of VBA routines to make Excel e-mail friendly. Where Have All the Bytes Gone? You can create a list in Excel of all the folders on a drive and their sizes. 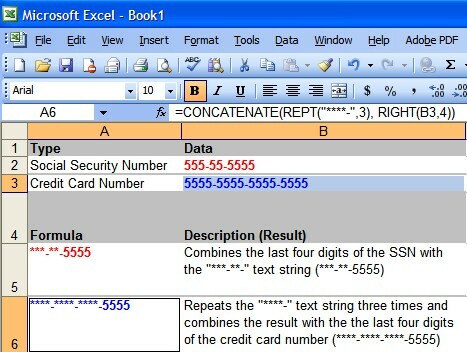 Copy the code and open Excel. You could use Alt+Tab to bring the worksheet forward. Go to Tools>Macros and run the Macro named "GetFolderListing". Have you found that you cannot update linked Excel tables in Access 2003? You might try reinstalling and then only installing SP1. "A jury in U.S. federal court found that Microsoft infringed on a Guatemalan inventor's 1994 patent on technology linking the company's Access and Excel programs, and ordered the world's largest software maker to pay $8.9 million in damages. The following macro has little or no practical computing value, but it can add a "way cool" element when a worksheet is unhidden. There are three states that a worksheet can be in; Minimized, Maximized, and Normal. Here's a hint that I had forgotten about. You can tie the result of a cell to an AutoShape. This displays the value in a more dramatic manner. With the shape selected, type an equal sign in the formula bar. Thanks to AutomateExcel.com for the reminder. Timothy Miller uses the nom de screen of "Jethro" (Moses' Father-in-Law). One of the easiest ways to set up spreadsheets that calculate or generate results that need to be reported is to separate the function from the form. Just like a shiny exterior on a car hides the internal engine and wiring. I always create my reports and front end menus to look good and generate results and calculations in more functional sheets. If you must have calculations and working sections visible, then hide the unnecessary bits. Hiding a row or column is only one way of doing this. Using the group function you can rollup whole rows of information, e.g. components that add to a subtotal or constants and variables such as exchange rates, interest rates, and other indexes. 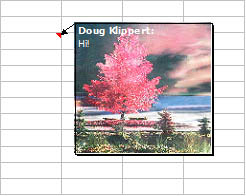 I like to use the company logo or other graphic as a design element in my spreadsheet. Sometimes I do this by using the corporate colours, other times by using the graphic itself. If I have a spreadsheet with a lot of macro buttons, I may use command objects and use the logo as a picture on the button. There are a number of excel components that you can turn off. 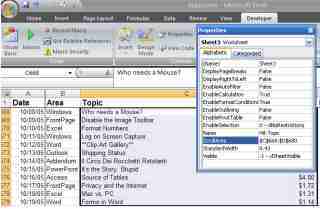 Menu screens and reports screens may not need horizontal or vertical scroll bars, sheet tabs or row and column headings. Using macro buttons to return to a menu can overcome the need for sheet tabs. Not displaying gridlines will give a clean uncluttered look to a layout, and then using borders as necessary can create emphasis in the right areas. 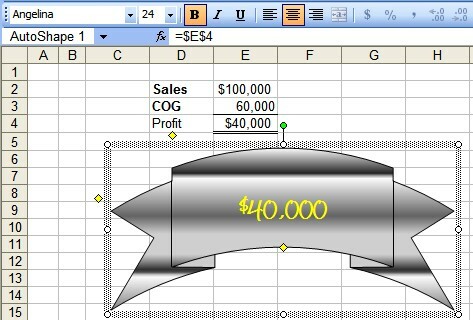 Here are a few of the major changes in Excel 2007. These were reported by David Gainer. "The default date system in Excel 2004 for Mac is the 1904 date system. The default date system in Excel 2003 is the 1900 date system. Typically, the use of different date systems does not cause a problem. However, if you transfer a workbook from Excel to Excel for Mac, or vice versa, and then copy a date from one workbook to the other, the date may increase or decrease by four years and one day. This issue occurs if the two workbooks use different date systems. For example, if you copy the date 1/1/1998 from a workbook that uses the 1900 date system and then paste the date into a workbook that uses the 1904 date system, the date appears as 1/2/2002. Alternatively, if you copy the date 1/1/1998 from a workbook that uses the 1904 date system and then paste the date into a workbook that uses the 1900 date system, the date appears as 12/31/1993. As long as you know about the date systems that your workbooks use, the different date systems should not cause a problem. Here is an almost forgotten sample spreadsheet. It was constructed, for Microsoft, back in 1997 by Lori B. Turner, and is still relevant. In cell A1, enter the text "You still owe the sum of". In cell A2, enter the number "5434". In cell A3, enter the text "for invoice # 2232 from 6/15/2001". In cell A4, enter the formula =A1&" "&TEXT(A2,"#,##0")&" "&A3. The data in Access or Excel has been formatted. You have leading zeros, percents, currency is formatted and so on. Word 200+, however loses the formatting when a mail merge is attempted. Word has three potential data access methods, the "old fashioned" ODBC or DDE and the newer OLE DB. ODBC and OLE DB can, quickly, extract data from a source application without opening the program. The application does not even have to be installed. The downside is that these methods do not transfer the formatting in the data file. Individual MERGEFIELDs need to be formatted in Word. 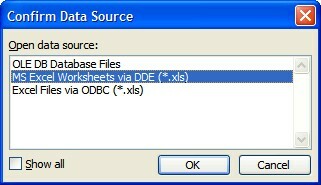 DDE can be used with Excel and Access. It communicates with the source and carries the formatting into the target document. This is how it worked before Word 2002. Tools>Options>General "Confirm Conversions at Open"
When you connect to the Data Source, a dialog box will give you the opportunity to choose the type of connection to use. If you don't see DDE, check Show all. Excel is most happy when you enter dates and times with the correct separators. 1/1/2004 is a good date. So is 1-1-2004.
the 112,004th day since January 1, 1900. Chip Pearson has come up with VBA code, using the Worksheet_Change event procedure, that will allow you to enter dates without dashes or slashes. Conditional formatting can be set up by selecting the whole range, or for the first cell in the range and then copy down that conditional format. I find it is usually just as easy to select the whole range to start with. The formula will adjust itself. In this example, cell B2 has a heading of Product Numbers. Select cell B3 (or the entire targeted range) and from the menu. After selecting "Formula Is", the dialog box changes appearance. Instead of boxes for "Between x and y", there is now a single formula box. You can type in any formula as long as that formula will evaluate to TRUE or FALSE. This says, "look through the entire range of column B. Count how many cells in that range are the same value as what is in B3." That same comparison will be made in every cell that contains the conditional formatting. Anytime a duplicate appears in the range, it will receive the special formatting. In this example, any time a duplicate number appears anywhere in column B, even if it is not itself formatted, the selected range will reflect the duplicate. =COUNT(B:B,B3)>2 would count entries that appear more than two times. =COUNT(B:B,B3)=2 would count entries that appear twice. Worksheets can be dragged and dropped into any order required. They can be set up in numeric or alpha order, but doing it by hand is a bother. (The colorindex variable chooses one of the 56 colors in Excel's basic palette. "I wonder how our net profit would be affected if we could reduce our variable cost per unit by just a few cents. How much could we save if we found a lower interest rate? Wouldn't it be nice to be able to play around with some scenarios, do some "what-ifs" â€” without messing up your current data? It's easy with Microsoft Office Excel . You can set up "scenarios" to experiment with the data and compare the possibilities. Who knows? It could be a road map to better solutions for your business." " To find out how to use what-if functions, follow along as this tutorial takes you step-by-step through several problems. Excel 2000 is used here to illustrate these concepts, but the process is similar in all spreadsheet programs." Normalization, simplistically, is setting up tables of data so that information is entered only one time. Access is not as malleable as Excel, so for demonstration purposes, spreadsheet entries can be used to show the concept. 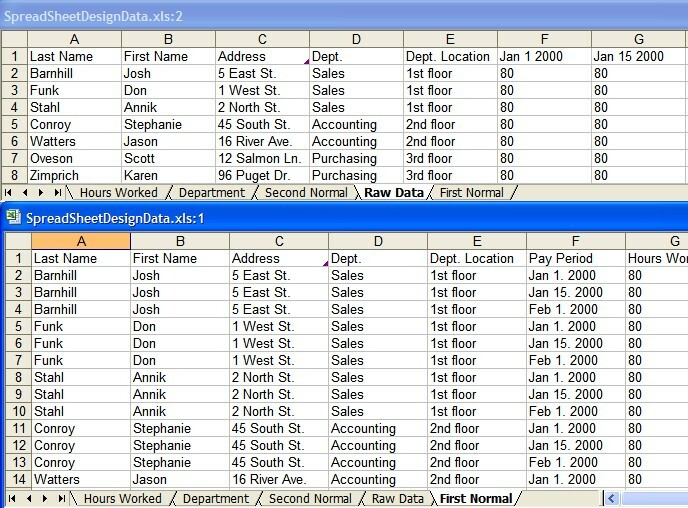 "This article explains how to use Microsoft Excel to create prototypes of your Access databases and how to make sure your data adheres to a set of rules called normal forms. Normal forms aren't hard to understand, and they're critical to designing useful databases." Back in the day, Barnes Consulting was a major player with Office 97. They've gone on to other consulting areas, but you can still study what they called "On-Line Experiences". These detail the benefits and outline the steps of many Excel features. They are worth the download. They are a great resource for learning advanced features, training, and tips on a great consistent presentation that you can use to format your workbooks. While they were written for Microsoft Excel versions 5.0 and 7.0, they are still viable in Excel 200x. These Experiences were developed for Microsoft Corporation by Baarns Publishing. Many times an office will provide Excel for all users, but not want or need to also install Access on every desk. Helen Feddema has laid out a method to use the data in an Access database to create Excel workbooks. These workbooks can then be e-mailed to employees to be used to record time spent on projects. The code provided is above the entry level user, but understandable. There is a downloadable file that includes the instructions and samples of the Access and Excel files. Go to Access Archon Columns from Woody's Office Watch. The pertinent file is down near the bottom of the page. Look for article 127 and download accarch127.zip. Right-click the cell that contains the comment. Choose Edit Comment, and clear any text from the comment. Charles Maxson has some code that will place a picture in the comment box based on the contents of a cell.
" Imagine that you have a list of parts for a product and you want to assign them to cells... then your users could see them as they hover over the cells." Mary Ann Richardson, on TechRepublic.com, suggests saving a graph as a JPG and using that as a picture in a comment. Excel has a tool to sort lists with a number of criteria. Select a single cell in the table and go to Data>Filter AutoFilter. Click on the down arrow next to the field name and choose Custom. The illustration shows how to set up a filter that displays data between two dates. "Some tips and techniques for working with AutoFilters, and some workarounds for problems you may encounter." "If you frequently use Autofilter to view portions of your worksheets, you might find Custom Views to be a useful tool. Custom Views can be easily set up based on your Autofilter criteria. Once that is done, the worksheet views that you have created display in a drop down list so you (or others) can select them." "The Display Filter Criteria doesn't work well. It only works when after set the filter, the cell with the formula is selected. Then press F2 en after that push the Enter key. Then it works. but the cell with the formula isn't updated automatically..."
Here are some useful macros concerning Excel and printing. Change the default printer with a macro. This example macro inserts a header/footer in every worksheet in the active workbook. It also inserts the complete path to the workbook. With these macros you can print all workbooks in a selected folder. You have more control with what is printed than you have if you do this from Windows Explorer. If selected multiple cell ranges is printed out on different sheets, you can use this macro example to print all the selected areas on one sheet. In Excel you don't have the opportunity to set the properties FirstPageTray or OtherPagesTray like you can in Word. It's possible to create a simple solution by using SendKeys. "Why was March better than February?" "Where is the sales force having the most success?" "In what conditions does the sales team struggle with making sales?"